In 2012 ATLAS and CMS , experiments at the CERN Large Hadron Collider, announced the discovery of 'a new particle, found during the search for the Higgs particle'. 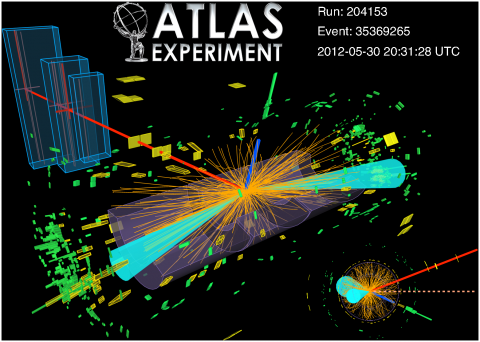 Is this new particle indeed the Higgs particle? A further analysis of the data had to demonstrate whether the characteristics of the particle found were indeed the same as the predicted characteristics of the Higgs particle. In 2013, the ATLAS experiment performed that analysis. The standard model of particle physics makes several predictions about the Higgs particle. First of all the Higgs particle has no spin. Secondly the particle has an equal parity, which means that its wave function exhibits reflectional symmetry. In addition, the Higgs particle does not interact directly with photons, but the couplings to the particles that convey the weak nuclear force (W- and Z-bosons) have a precisely defined value. Finally the couplings of the Higgs particle to quarks and leptons are proportionate to the mass of those particles. The first two predictions, about spin and parity, can be tested by analysing the decay of the Higgs particle. If the Higgs particle decays into other particles then the angle under which these new particles escape indicates the spin and parity of the Higgs particles. Nikhef researchers played a leading role in the analysis of the Higgs decay into two W- or two Z-bosons. Analysis of their data revealed with a certainty of 99 percent that the particle had no spin. The equal parity was confirmed with a certainty of 97 percent. The couplings of the Higgs particle can be determined from the quantity of Higgs particles detected in the various final states in which the particle can decay. In 2013, ATLAS unequivocally demonstrated for the first time that the Higgs particle can also decay into two tau leptons. With the help of the fit software partly developed at Nikhef the Higgs couplings were measured. Within the measurement error these values corresponded with the theoretical predictions. Without a doubt these measurements were a crucial factor in the awarding of the Nobel Prize in Physics 2013 to Francois Englert and Peter Higgs. Watch the Dutch film: 'Higgs: Naar het hart van de verbeelding'. In 2013 the Dutch children's TV programme 'the Klokhuis' devoted an episode to the Nikhef research. 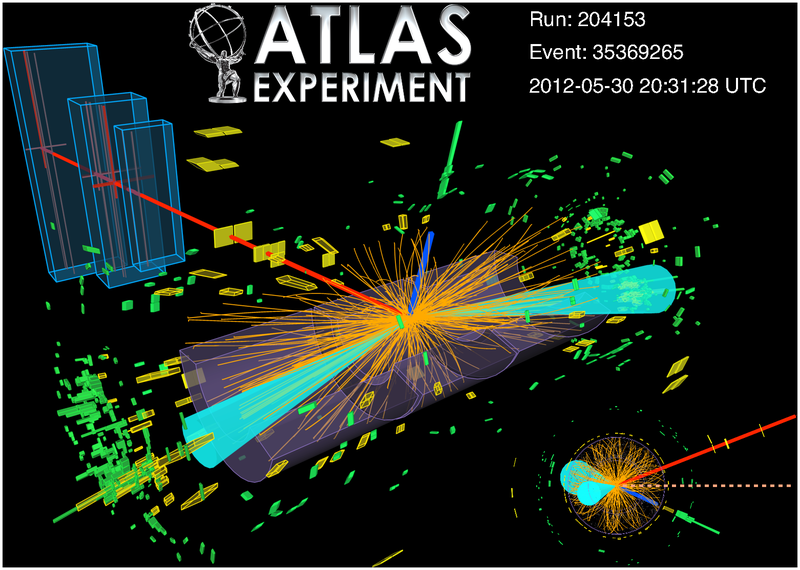 A candidate event for the decay of a Higgs particle into two tau leptons, measured in the ATLAS experiment. The two tau leptons are unstable and decay: one tau lepton decays into a muon (red track) and two neutrinos, the other tau lepton decays into an electron (blue track) and two neutrinos. The neutrinos escape the ATLAS experiment unseen. The event also contains many other traces of particles that are remnants of the original protons that collided with each other.